The owners of this property in the Meridian Kessler neighborhood of Indianapolis called us in to revitalize their limited outdoor space to turn it from some foundation plantings and lawn into a multi-purpose space that would bring their family outside and improve curb appeal. 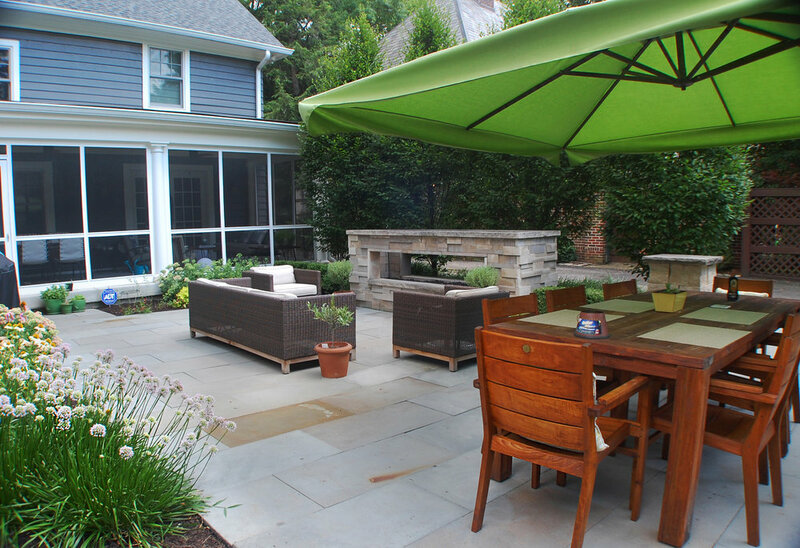 We completed this project in two phases: first we did a functional overhaul on the back yard, and then a few years later we dressed up the front yard to fit with the new style and feel of the re-vamped back yard. In the plant selection and layout, we also built a landscape that has something for every season. 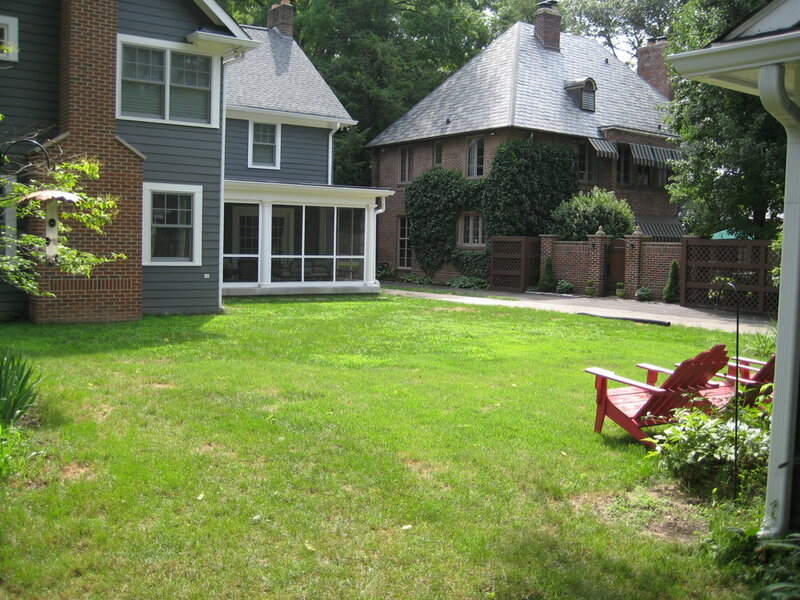 The existing space was all lawn with some plantings near the garage. 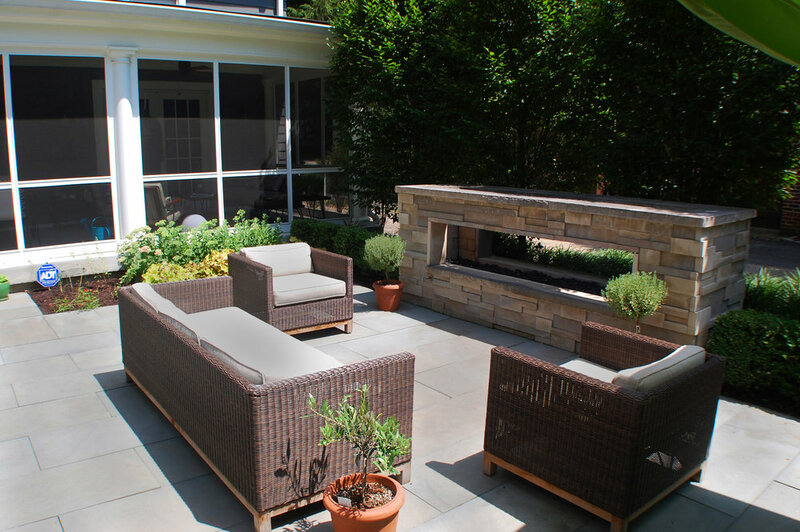 The client wanted a more formalized space for smaller get-togethers as well as raised planting beds for growing some herbs and vegetables. 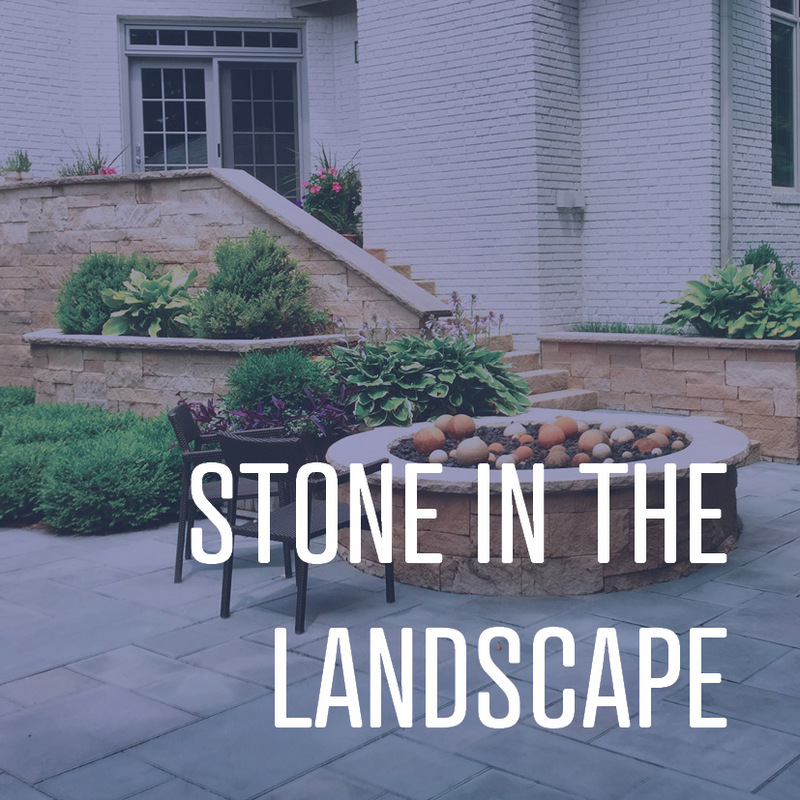 So we put in a bluestone patio separated from the drive by a low limestone wall and fireplace, and separated from the house and the remaining lawn by planting beds packed with colorful perennials. The patio is large enough for a family-sized table as well as a separate, more casual seating area centered on the fireplace. Moving out from the patio, a line of columnar hornbeams serves as a soft natural barrier between the patio and the driveway and blocks the view from the neighbor’s back yard. In the winter, their smooth, gray bark and dense branching will still provide screening and interesting texture. The hornbeams are backed by a low line of boxwoods filling in between the limestone columns and fireplace as a living wall with a bit of green for all four seasons. On the other side of the patio, the remaining lawn was shaped as a circle intersecting with the patio. The lawn is surrounded by perennial beds, and a water feature is tucked into one of those spaces for a soothing sound component. The water feature adds a sound and movement component from spring through fall, and it still provides visual interest in the winter. The perennial selection peaks in late summer with everything blooming all at once, but the alliums emerge in early spring, and the heucheras are delightful all year long. Two additional practical features were incorporated: a bike storage area next to the garage is screened from view on the patio by the low limestone wall. Beyond the lawn circle behind the garage we built a gravel area for raised planting beds which doubles as a more shaded and secluded nook for relaxation. Click on any of the images below to view them larger. 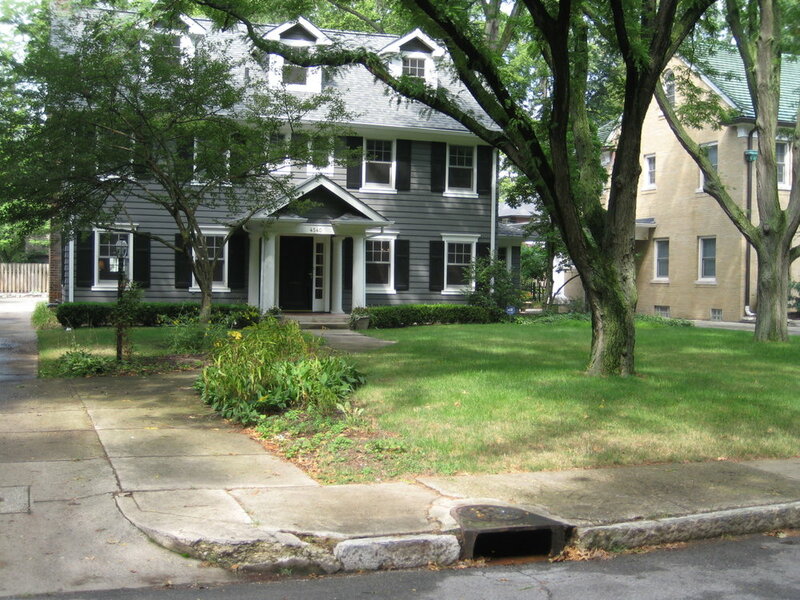 The redesign for the front yard focused less on functionality and more on curb appeal. The expanse of lawn was originally just decorated with a few planting beds along the front of the house and at the end of the walk leading from the driveway to the front door. We stepped back and re-imagined the full yard as a canvas and drew in planting beds as interacting shapes. These bed shapes provide interest and structure any time there isn’t snow on the ground, even if the plants aren’t green and blooming mid-summer. A new walkway was built from the same materials as the patio in the back yard. The edge along the sidewalk was framed by walls using the same limestone used in the short columns that frame the entrance to the back patio. Subtle craftsman-style light fixtures and address numbers on the limestone walls are both attractive and functional. A mix of shade perennials shows off the surprising range of plants available for shade beyond just hostas, including semi-evergreen liriope and heuchera. Click on any of the images below to view them larger. Want to get started on your own project? Visit our portfolio or read more project spotlights for more inspiration, or contact us to schedule a consultation.